CBH GROUP’S delivery app is available for use at all delivery sites in Western Australia for the first time this year following its partial release in 2017. Last year, the CDF app was used to deliver around 19,000 truckloads weighing close to 900,000 tonnes in total, which covered almost one third of the loads delivered to the sites at which it was offered. The app’s general roll-out has followed its favourable reception from growers and carriers who used it last year to pre-submit details of upcoming loads to the delivery site as part of the industry’s transition to digital information from the traditional multiform paper system. 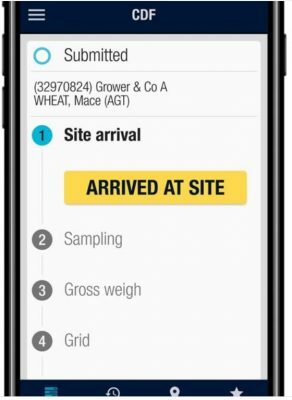 When a load of grain logged in the CDF app arrives at site for sampling, its information is automatically transferred, and when assessment is complete, its results are immediately available through the app. This enables the truck driver to choose and accept a grade, and continue with the delivery, or opt to deliver to another site. Real-time notifications are sent to the grower of sampling results, along with the driver’s arrival and departure time from the receival site. The app also shows which sites are open, which grains are being accepted at each site, and approximate waiting times for deliveries. CBH general manager operations, David Capper, said the app showed load-quality results so a grower back at the farm could make real-time decisions based on the analysis of the truckload. Mr Capper said an additional benefit of the app was its ability to allow CBH to accurately measure the performance of sites during harvest, including truck wait times before the sample shed. “We can use this data to get a more in-depth understanding of how to better manage and speed up cycle times during harvest, as well as prioritise future investment in the network,” Mr Capper said. The app is available for Apple and Android devices from the App Store and Google Play, and a guide to using it is available at www.cbh.com.au/cdfapp.